Bring a large pot of heavily salted water to boil for the pasta. 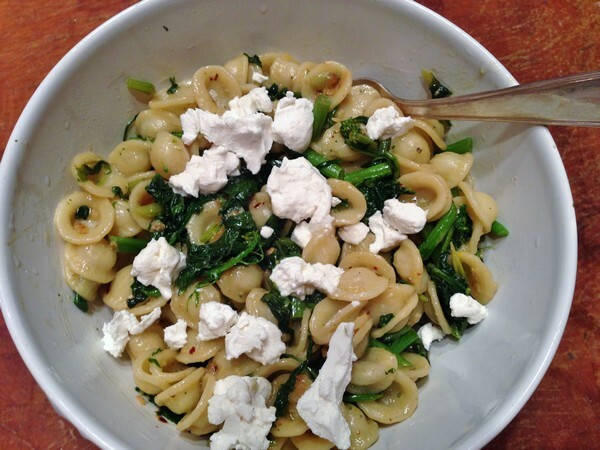 Cook the orecchiette until just al dente. 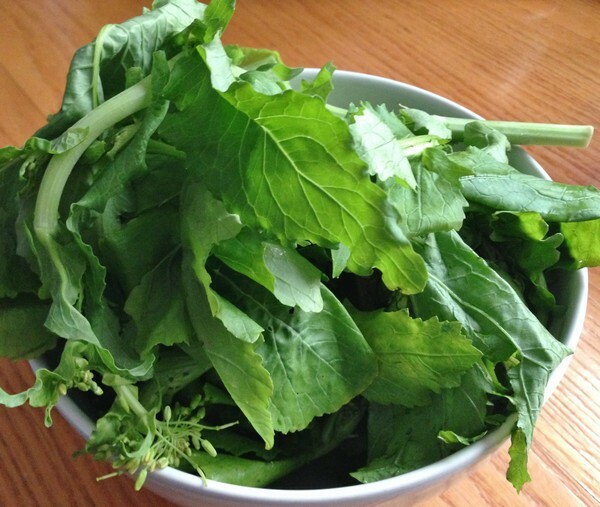 Steam the broccoli rabe until crisp-tender. I used a covered dish in the microwave for 2 minutes. When the broccoli is cooked, add the olive oil to a large sauté pan over medium heat. Add the garlic and cook until golden, about 3 minutes. Add the red pepper flakes and cook for about 30 seconds. Add the broccoli rabe, toss in the oil and reduce the heat to low. My verdict: Yummy! Between adding the pasta water to make a sauce and the goat cheese, it’s a wonderful, creamy pasta. I’ve made it twice, the second time adding a large piece of Italian sausage that I crumbled up and cooked before adding the garlic etc. Frank loved it, which is a sign that’s it’s a good dish, as he’s not terribly fond of broccoli rabe. Funnily, both times I’ve made it, I’ve wanted to toss some toasted pine nuts into it, but both times was too lazy to go toast them. Some chopped olives, or sautéed mushrooms might be nice too. Speaking of lazy, one of the chores we both hate is washing the pasta pot. That’s changed since we discovered Fasta Pasta. It’s a microwave pasta cooker (if you’re Italian and/or fussy about cooking pasta, just skip this) and it works like crazy! 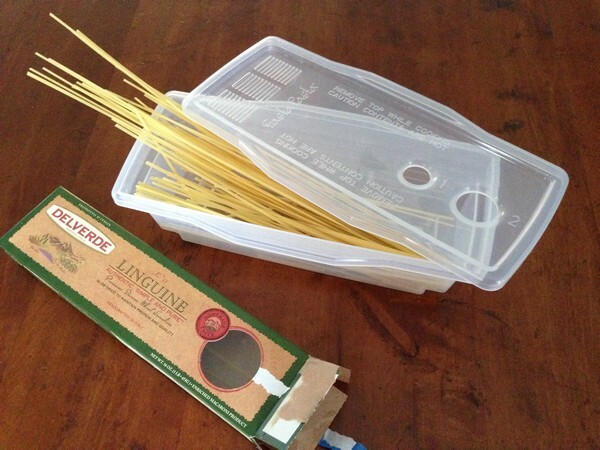 It’s a box that you fill with pasta and water and pop in the microwave. When it’s done, add the lid and it drains the pasta. There’s a chart that gives you amounts and times. What it doesn’t tell you, is that like most pasta, it’s much better when you add a healthy dose of salt to the water. If you’re cooking for a crowd, you’re probably better off with the traditional pot, but for a couple of people it’s just genius! It’s dishwasher safe and takes up much less space than the pasta pot (that we store it in). Bring a large pot of salted water to a boil over high heat for the pasta. While the pasta water is heating, warm the olive oil in a large skillet over medium-high heat. Add shallots and cook 3 minutes until they begin to brown, stirring occasionally. Add chorizo and cook, breaking into large chunks with a spoon, until browned and cooked through, 5-7 minutes. Add tomato paste and red pepper flakes to skillet and cook, stirring, until paste darkens, about 1 minute. Add broth; bring to a boil, reduce heat, and simmer, stirring occasionally, until sauce is thickened, 15-20 minutes. Add chickpeas and cook until heated through, about 2 minutes. While the sauce is thickening, cook the pasta until al dente. Drain pasta, reserving 1 cup pasta cooking liquid. Add pasta and 1/2 cup pasta cooking liquid to the skillet. Cook, stirring and adding more cooking liquid as needed, until sauce thickens and coats pasta, about 3 minutes. Sprinkle pasta with lemon zest, Parmesan and parsley, serve and enjoy! My verdict: If I didn’t have everything on hand (except the parsley), I probably never would have made this. That being said, this was a pretty good dish! The lemon zest is the key ingredient—taking it from being only ok to being really good. My biggest complaint with it was that the chorizo I was using ended up in very tiny pieces. The next time I make it, I’ll try not to break it up so much (however, this might not be an issue with other types of sausage). Any type of fresh sausage would probably work well. 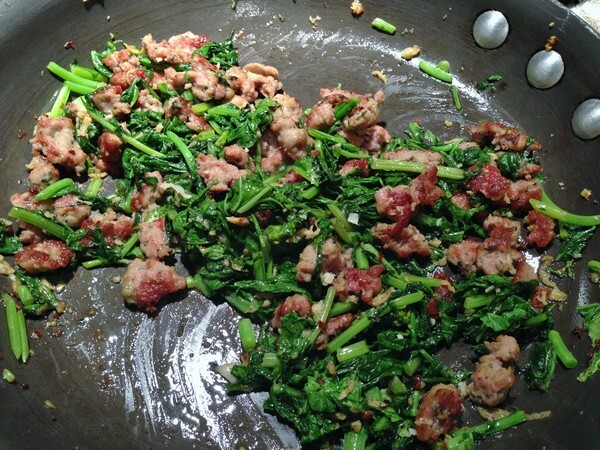 I’d give it a try with merguez (maybe substitute cilantro for the parsley), or any kind of Italian sausage – I have some with broccoli rabe in it, that would be good! If you drive the Taconic Parkway, you may have noticed a lot of renovation being done on one of the “Park N Ride” stops. Governor Cuomo rescued the abandoned building and opened it earlier this summer to showcase local New York products. As this is something the Accidental Locavore is pretty passionate about, it was only a matter of time before I went to check it out. Actually, I was waiting until we got well into the summer, to see what sort of fresh produce they would have. The other day after a harrowing ride home, I decided that it would give me the perfect break. One of the arguments against farm-fresh, local etc., is that it’s expensive. 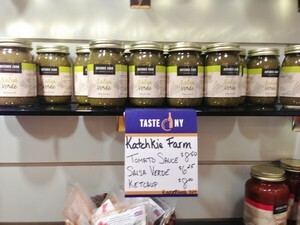 Well, if you think your local farmers’ market is pricy, check out Taste New York! Talk about sticker shock, I thought I was back at E.A.T., Dean & Deluca, or any other stupidly expensive Manhattan grocery. Vidalia onions $2. That’s each onion. Italian sausages, local (and frozen) $12.95 a package. Well, they might sample once, but after paying those prices, they’re not going to be able to afford to come back again and again! And, since Cuomo’s significant other (Sandra Lee), is known for her Money Saving Meals, you would think she might have given him a reality check. 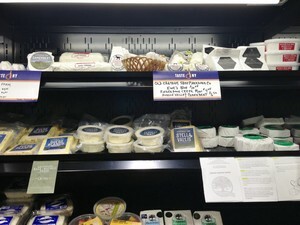 If you want local products, do come up the Taconic, but pull off on almost any exit and explore the local markets. 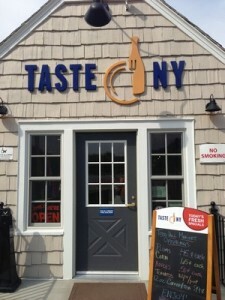 There are great local products there, and while some of them may be pricy, it’s not the stupidly expensive Taste New York. Like wives from the sitcoms, the Accidental Locavore knows that there are two dishes guaranteed to put my husband in a good mood. Albondigas (Mexican meatballs) are a close second, but his favorite has to be pasta puttanesca. It’s super easy to make-supposedly the Italian working girls used to make it between tricks, and most of the ingredients are things you probably have on hand. This makes two very generous servings with leftovers. I’ve given you measurements, but feel free to improvise. In a large pot, bring well salted water to boil for the pasta (or use the Fasta Pasta pictured). In a large skillet, heat the oil over medium heat. Add the anchovies and allow to melt in the oil. When the anchovies are melted, add the garlic. Reduce heat to medium-low and add the crushed tomatoes, capers, olives, red pepper flakes, pepper and sausage, if using. Stir to combine. Taste and check for seasonings. Let simmer while the pasta cooks. When the pasta is cooked, drain it and add to the sauce. Mix well. 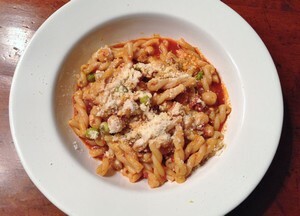 Serve with freshly grated Parmesan and enjoy! Notes: Cooking the anchovies in the oil and allowing them to melt, adds tons of flavor. It’s a pain to pit olives when you’re in a hurry (do it by smashing them with the side of a knife), so I always try to keep mixed pitted olives on hand and when I can find them, chopped mixed pitted olives. You could used diced plum tomatoes, but the whole ones, crushed by hand, is better and gives the finished dish a nice, rustic texture. Use either hot or sweet Italian sausage, or a mix, and grill them and slice them, or cut off the casings and crumble. 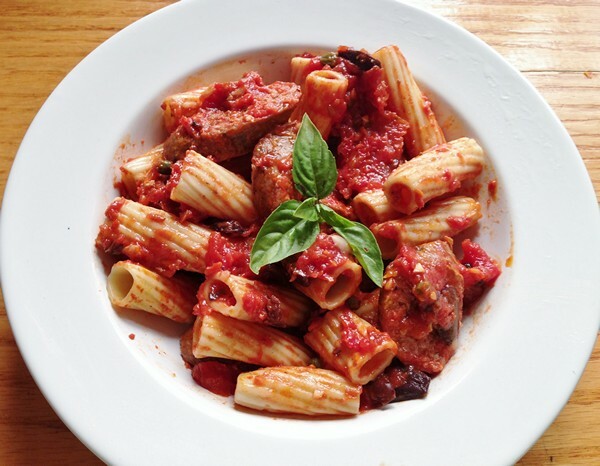 If you cut off the casings and crumble the sausage, add them right after the anchovies are melted, and give them a couple of minutes to cook before you add the rest of the ingredients. I don’t add salt to the sauce as most of the ingredients are pretty salty, but I add a lot to the pasta water-remember “it should taste like the sea”.